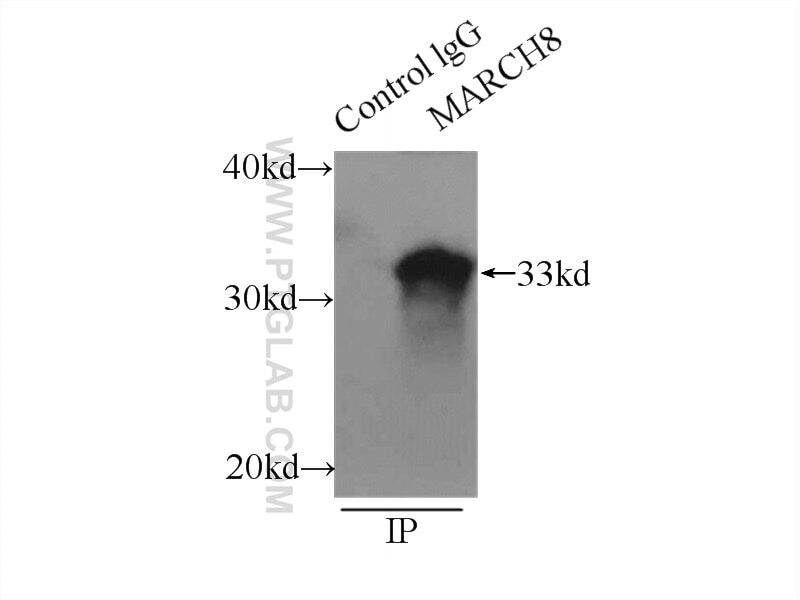 IP Result of anti-MARCH8 (IP:14119-1-AP, 3ug; Detection:14119-1-AP 1:400) with mouse lung tissue lysate 4000ug. MARCH8 (Membrane-associated RING finger protein 8) is also named as MIR, RNF178 and belongs to the RING zinc finger protein family. It functions as an E3 ubiquitin ligase for immune recognition-related molecules (e.g. major histocompatibility complex class I, B7-2, and ICAM-1). It plays a key role in controlling MHC class II surface expression by regulated ubiquitination of a lysine residue in the beta-chain (PMID:22761441). JWA regulates TRAIL-induced apoptosis via MARCH8-mediated DR4 ubiquitination in cisplatin-resistant gastric cancer cells. Tetherin Suppresses Type I Interferon Signaling by Targeting MAVS for NDP52-Mediated Selective Autophagic Degradation in Human Cells. The E3 ubiquitin ligase MARCH8 negatively regulates IL-1β-induced NF-κB activation by targeting the IL1RAP coreceptor for ubiquitination and degradation. Cell adhesion in zebrafish embryos is modulated by march8.